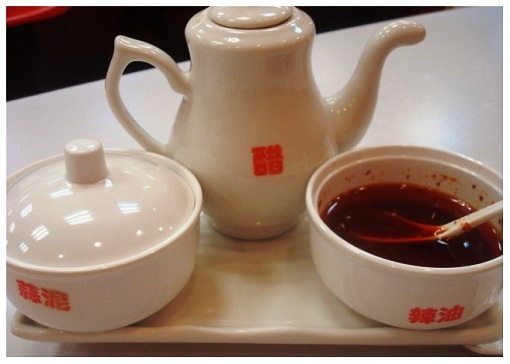 When it comes to Chinese fast food, we have many different choices, and dumpling is certainly a popular one. Recently I visited back to hometown in Hunan, found out that the traditional dumplings have updated their style, not just boiled or half pan fried, this time it is called iron plate fried dumplings. Just by looking the name, you can imagine how it is cooked. Yes, dumplings fried on a hot iron plate. Sounds amazing, right? In Hunan province, the place I came from, iron plate cooked dish seems to be very popular. One famous Hunan dish is called iron plate beef (Tie Ban Niu Rou 铁板牛肉), a very exciting dish, because you can see the meat and ingredients cooking in front of you. The iron plate has been heated very hot before it is brought to the table. Once the seasoned beef is poured on the piping hot iron plate, suddenly, it just likes an explosion of all kinds flavour, the smell of hot spices, the heat, the smoke and the sound of zzzzz…. 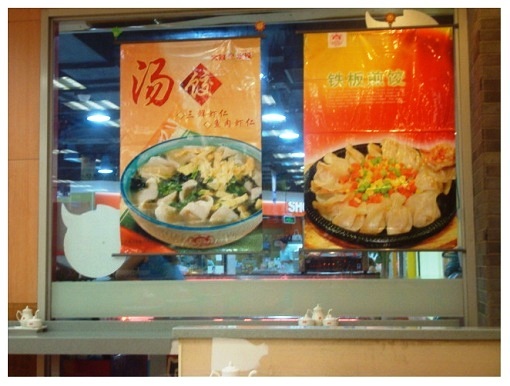 When saw this small dumpling restaurant next to the shopping mall, I was attracted by the pictures placed on its window. 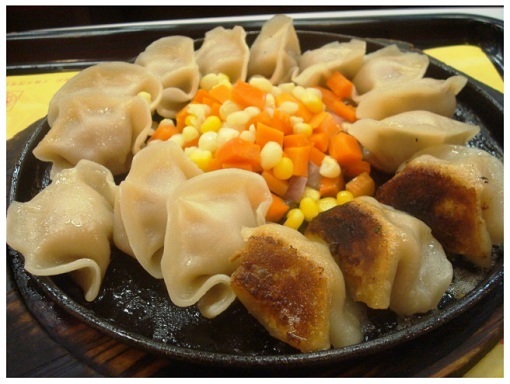 I won’t be surprised to see iron plate meat in Hunan, but iron plate dumpling? Well, it seems that the clever locals have adapted this iron plate to dumplings. Can’t wait to try. 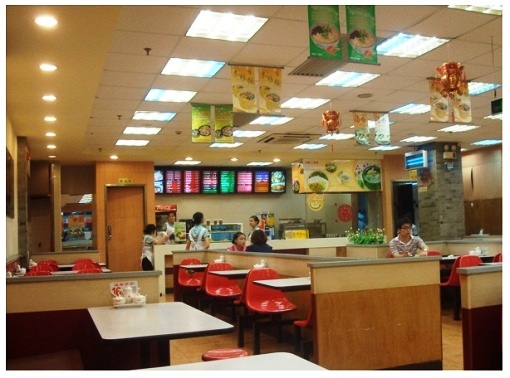 Coming inside, it is simple and typical layout for the Chinese fast food. 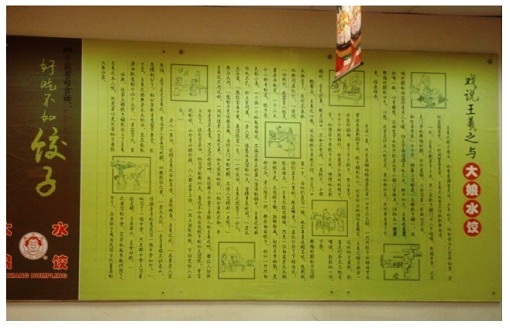 Like most Chinese restaurants, it uses the wall to show you the history of their food presented by traditional Chinese calligraphy. I wondered how many customers would read it but it looks nice. As always the sauces are provided on each table. Because this is a dumpling restaurant, apart from vinegar and chili oil, it also has the mashed garlic, which is the sauce many people like to have with dumplings. 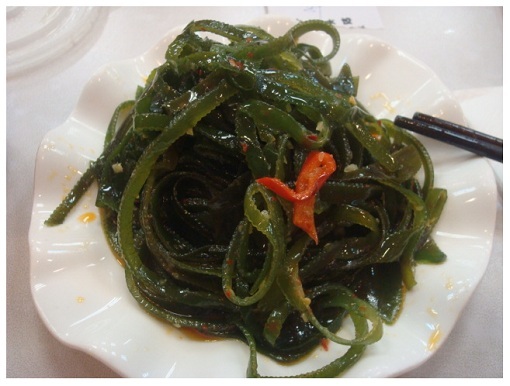 While waiting for the dumplings, you may order some small side dish such as this sea kelp salad, sour and spicy, which is one popular salad dish in the summer. 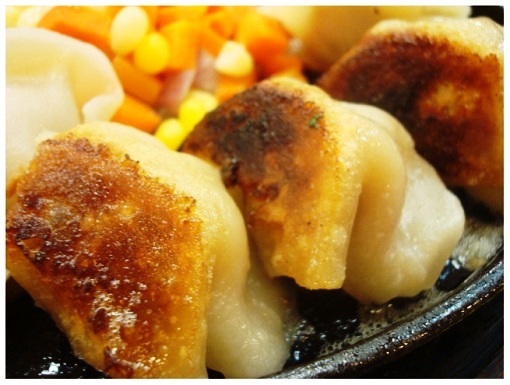 The dumplings are freshly made, not frozen ones, but it does not take that long. 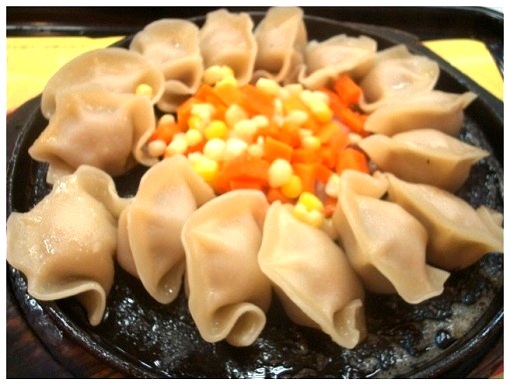 Here you are, the iron plate fried dumplings. The iron plate is so hot that you can still hear the zzz sound of dumplings frying on the plate. From the top they look like the boiled dumplings, but look another side, you can see it is fried. 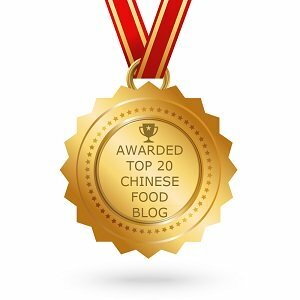 So it is just a normal Chinese fast food that you may find within a shopping mall, perfect for a quick lunch during shopping, cost about RMB30. Not bad at all. In UK, same price you can only get a cup of coffee plus a bag of crisps. 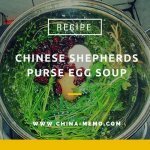 You may like to see other typical food in Hunan, check this Hunan Preserved Meat, how we prepare and cook this at home.